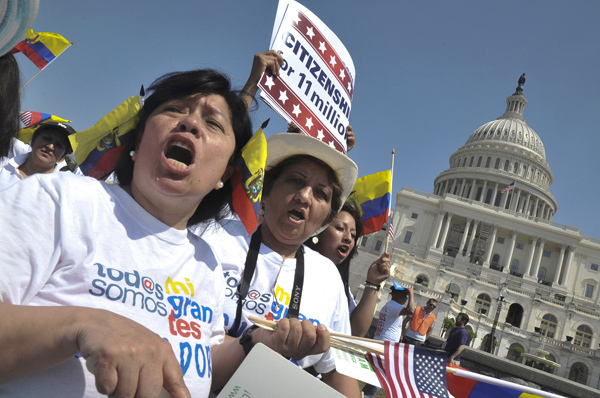 WASHINGTON (CNS) — At a massive rally on the West Lawn of the U.S. Capitol April 10, the underlying demand — comprehensive immigration reform — came with different primary interests for different people. A look at the range of issues underlying the effort to produce a bill that can pass in both the Democratic-controlled Senate and the Republican-controlled House helps explain why it’s taking so long for a bipartisan Senate panel to produce a bill, reported to be 1,500 pages long. — Make it easier to reunite families; stop separating parents from children and husbands from wives through deportation. — Allow undocumented immigrants to get driver’s licenses. — Enact the DREAM Act. — Shorten the waiting times for legal immigration and increase the number of visas for unskilled workers. — Give people who are living in the shadows a chance to legalize their status and stop hiding for fear of deportation. — Protect the labor rights of those who lack legal status. “All our families come here for the American dream,” said Fatima Abdelsadek, a 17-year-old from New York, who sat in the shade with a group of fellow children of Arab immigrants. Signs carried by participants, points raised by the dozens of speakers who took the stage, and testimony given in an ad hoc hearing in the House and at various news conferences around Washington raised all those points and more. Some people focused on self-interests, but not all. Fatima Abdelsadek, a 17-year-old from New York, sat in the shade with a group of fellow children of Arab immigrants. Though her family doesn’t face the legal obstacles that trouble many of the people at the rally, she passionately pursues the goals of comprehensive reform. “All our families come here for the American dream,” she said. She’s gathered hundreds of postcards for members of Congress calling for immigration reform. One news conference focused on the parents of young adults who would be affected by the DREAM Act, which would provide a path to legalization for those who were brought to the United States as children and remain in immigration limbo, lacking permission to live and work in the U.S. but disconnected from their homelands. At that event, DREAM Act activists introduced their mothers, who also lack legal status, and some of whom face deportation. “My dream is for my mother to live without fear and realize her own American dream,” said Lorella Praeli, according to a report of the press conference from organizers. “She is an original dreamer, who sacrificed so much for me to have a better future.” Praeli is United We Dream’s director of advocacy and policy. She was brought to the United States from Peru as a child as the family sought medical treatment. In a hearing room below the Capitol a short time later, a Jesuit priest from Arizona talked about the people he meets. “We at the Kino Border Initiative watch in disbelief as we receive women deported to Nogales (Mexico), while their husbands are repatriated to distant points of entry along the U.S.-Mexico border because of the Department of Homeland Security’s Alien Transfer Exit Program,'” said Father Sean Carroll, executive director of the Kino Border Initiative, a Jesuit ministry and education program. He spoke at an ad hoc hearing hosted by Rep. Raul Grijalva, D-Ariz.
“These women endure serious trauma because of separation from their husbands, since they are alone in an unfamiliar city and very vulnerable to exploitation and violence at the hands of organized criminal syndicates that prey on recently deported migrants,” the priest said. Other families remain separated, with parents deported to Mexico and minor children — often U.S. citizens — left in the care of extended family or foster homes, said Father Carroll. He cited a November 2011 report of the Applied Research Center, which said 5,100 children were in foster care because their parents were in immigration detention or had been deported. He referenced the Jesuits’ February report, “Documented Failures: The Consequences of Immigration Policy on the U.S.-Mexico Border,” which looked at data collected from March through October 2012 from nearly 5,000 people who passed through a dining hall in Nogales. Located a few blocks from the U.S. border, the dining room run by the Kino Initiative serves people who were recently deported or are planning to try to get into the United States illegally. The Mexican and Central American migrants were questioned about how they were treated by the U.S. Border Patrol and by police agencies in other countries and about the circumstances at home that led them to leave. The fact that it was an ad hoc hearing itself speaks to the complexities of immigration legislation. Typically such hearings are sponsored by members of the party that does not control their branch of Congress. Ad hoc sessions are held when the party that is in control won’t schedule a hearing on the topic, or won’t allow witnesses presenting certain perspectives. Half a dozen House Democrats, most of them freshmen from states with large immigrant populations, attended Grijalva’s hearing. Other data cited at the ad hoc hearing came from reports titled “How U.S. Immigration Policy Fragments New Mexico Families,” by the American Civil Liberties Union of New Mexico and the Regional Center for Border Rights, and “In the Shadow of the Wall: Family Separation, Immigration Enforcement and Security” by the Center for Latin American Studies at the University of Arizona.